Who doesn’t like to unwind in a hot tub or spend some quality time with family or friends? Unfortunately, buying the right inflatable hot tub isn’t that easy. What size should it be, how powerful, therefore – energy efficient, how many people should it accommodate? These are all reasonable questions to ask yourself before deciding which is the best inflatable hot tub for your specific needs. We’ll try to break down all the important factors you need to take into account in this article. After this buying guide, you’ll find the individual inflatable hot tub reviews. These are some of the most popular and best-rated products the UK market has to offer. Plus, at the end of this article, we’ll answer some of the most frequently asked questions. Choose the right hot tub for your purposes by thinking of how many people you want to squeeze inside. If you want to mainly relax on your own after a hard day at work, choose one that’s meant for about 2 people. If you want to use it with your spouse and children, a 4-person hot tub is a better choice. And if you want a hot tub for parties, a 6-person inflatable spa is the better choice. Conversely, a smaller hot tub is more portable and power-saving. Besides, the water can heat up faster, and it can be ready quicker. Most people want an inflatable hot tub because of the massage system it offers. If you want to have a relaxing spa experience, you need a hot tub that can produce a lot of bubbles. But that’s not just for fun, it can prove therapeutic too, especially if you have back problems. As such, take into account the number of air jets your hot tub has. More air jets equal more bubbles, but you should also consider the number of directions from which air jets are activated. That’s because the hot tub can fill faster, and provide a complete massaging experience. These factors tell you how quality the hot tub is. Polyester-based materials like PVC are among the sturdiest and lightest on the market, resistant to tears and punctures. Design-wise, you need to look for a user-friendly product, with an easy setup. There are different shapes for hot tubs to consider. A square or rectangular shape is better suited for fewer people, but it’s fairly stable. Conversely, a hexagonal, octagonal or round hot tub can accommodate more people. This is an important factor, especially if you want to use the hot tub outdoors in colder weather. As such, for outdoors and low temperatures, you need a hot tub with a maximum temperature of 40-42ᵒ C.
You should also take into account how fast the product can reach the desired temperature. If you have no problem with planning your spa sessions in advance, you can choose a more affordable hot tub that takes longer to heat. But if you’re a fan of impromptu baths, choose a tub that can heat faster. How you adjust your temperature while you’re in the hot tub is equally important. A digital heater works well and is reliable. However, remote control activation might be more complicated for tech-challenged people, but it’s more comfortable than getting up and doing the adjustments manually. We’ll deal with this issue in the FAQ section below. However, as a general rule (and common sense), a smaller hot tub consumes less power than a bigger one. Besides, if saving energy costs is important for you, consider getting a product equipped with a power saving timer, even if that means scheduling your time spent in the tub. If you want to buy a portable spa, you first need to consider its weight and size. A hot tub that’s easy to install, especially with no tools, is even more portable. If your inflatable tub comes with a carry bag or includes carry handles, all the better portability-wise. The most common included extras are chemical floaters that offer filter cartridges, which will help you clean the water a couple of times. A few test strips are also useful for testing your water’s pH and alkalinity levels. Some hot tubs feature covers, which are great in inclement weather, especially if they don’t allow water to pool. Ground mats provide insulation and support so, if you want to set up your hot tub in a place with uneven ground, make sure the mat is thick. A thermal ground cloth is perfect for lower temperatures. Another great addition is a garden hose adaptor with multiple hose tail fittings, so you can get water inside the tub easily. A wrench or other set up tools included in the pack show real user-friendliness. The Miami Hot Tub is not just one of the most popular hot tubs on the UK market, but also one of the most portable too. It’s being advertised as a 2-4 person hot tub, so it’s great for families with young kids to relax in but 4 adults squeezed in there wouldn’t feel too comfortable. The package includes two filter cartridges inside the chemical floater and this product is CE/GS/EMC approved, so you know it’s safe and working properly. The water temperature can get up to 40ᵒC and the Lay-Z-Massage Jet System features 81 jets. Even if this is a relatively small product, it can fill with 800 litres of water, with a water flow of 1 325 litres/hour. However, when the bubbles are on, the hot tub is a bit noisy. The rapid heating system is another advantage and thanks to the digitally controlled heater you can set up your own temperature. Unfortunately, the power consumption is on the high side, with approximately 2050 W/h at 20ᵒ. Click here to check today's price. This 4-person hot tub is one of the cheapest on the market, but it’s still a high-quality product. The tub itself looks stylish, considering its square shape and charcoal grey colour, but it’s also built with durability in mind, from Rhino-Tech 6 layer reinforced PVC. The safety buckle design is another plus, and so is the remote control operation. In fact, the whole design of this MSPA hot tub shows user-friendliness, with its easy temperature adjustment and the preset heating timer that makes it easy to use. Apart from that, the package is really complete, with included wired controller, hose adaptor, and filters, as well as a cover, ground mat and even a wrench to help you set this hot tub up. However, the cover allows water to pool when it’s raining, which is why it’s best to set this hot tub up in dry weather. The maximum temperature is a warm 42ᵒC, and the maximum 930 litres capacity give you plenty of room to swim around. It has 132 dynamic air jets and the upside is that the 1500 W heater won’t break the bank. 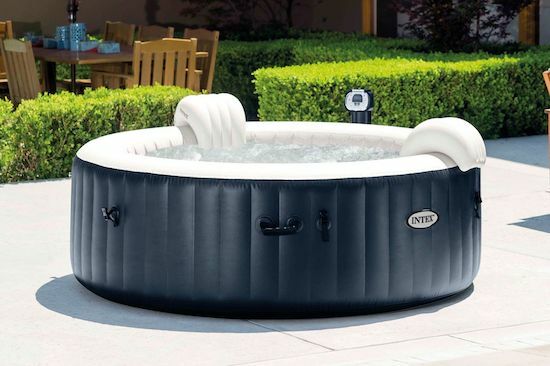 The Intex Pure Spa is one of the best hot tubs to use for therapeutic purposes, with its ergonomic design and bubble jets. Besides, it has a built-in hard water treatment, meaning your skin won’t dry up if you use this item. The whole thing was built with user-friendliness in mind, starting with the sturdy laminate PVC material. It has an octagonal shape that can easily accommodate 4 people, but there’s also the 6-person hot tub model on the main product page. And the package is complete with all sorts of useful extras, including thermal ground cloth, an inflation hose and carry bag. You even get a 3-way strip to test the pH of this hot tub and make sure it’s safe to use, as well as a 1-year guarantee. The adjusting heat system makes it easy to set the right temperature between20-40ᵒ C, while the 795 litres capacity is quite roomy. Besides, the 1,741 litres water flow helps to keep the water clean, especially thanks to the 2 filter cartridges and floating chlorine dispenser. On the other hand, the 800 W air blower and 2200 W heater amount to a fairly big power consumption. With many quality features, the hot tub itself doesn’t come very cheap, though. The Maldives HydroJet hot tub is one of the largest hot tubs on the market, considering it can accommodate up to 7 people and boasts a 1050-litre capacity. Besides, the Aqua glow LEDs are quite colourful and fun, and the inflatable seats make it comfortable for hours at a time. However, the HydroJet pro massage system makes this hot tub worth every penny. There are 140 air jets that burst from 8 directions thanks to HydroJets that are flow-adjustable. Besides, the built-in foot massager will help you relax even more, providing a rounded spa experience. There’s a rapid heating system with an adjustable temperature, that allows you to heat the water to 40ᵒ C max, while also enjoying the integrated massage system. 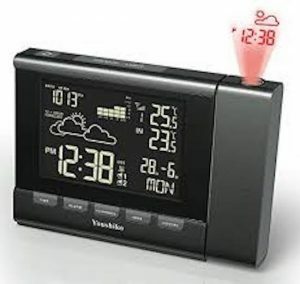 Besides, the power saving timer is quite user-friendly, helping you minimise costs. The package is quite generous too, with included Tri-tech liner, filter, floater, air pad protector and inflatable cover. The tub itself is fairly low-maintenance, but you need to keep an eye on the chlorine level. The Siena Airjet Lay-Z-Spa hot tub is one of the best hot tubs to take with you on a camping trip, seeing as it’s so small, portable and boasts a tool-free installation. With its 127 AirJets, it will give you a relaxing spa experience in the great outdoors. Besides, the 509-litre capacity is pretty generous, keeping in mind that this is a 2-person hot tub. However, if you’re a tall person, the water level might seem a bit low. Another common problem is that a few users complain about pump leaks. The rapid heating system works very well, as it can quickly heat up the tub to 40ᵒ C. Besides, the TriTech material is high-quality, while the I-Beam construction is sturdy. The cover is leatheroid, which is another sturdy material, and there’s an inflatable lid with double-lock safety clips which add portability points. Besides, the inflatable lid with double-lock safety clips is quite cushiony and insulating, for most terrain types and colder weather. The downside is that this hot tub costs quite a lot to power and run. If you want to save some money, you need to schedule at least 3 days in advance when you’re using it, so you can start the power saving timer. After reading these inflatable hot tub reviews, let’s tackle some issues that bug people who want to buy these sorts of products. Yes. They’re good, provided you choose carefully, according to your purposes, number of people and take into account things like materials and design. While inflatable spas aren’t as sturdy on the long-term as permanent hot tubs, the best ones are pretty resilient and much more affordable. How much a hot tub costs to run depends on various factors, like its size, the number of water jets, how often you’re using it and how long for. On average, provided you’re going to enjoy the bubbles for around 2-3 hours, a 2-person hot tub costs about £1 each use for electricity and about the same for water treatments. These costs are pretty much doubled for a 4-person spa and tripled for a 6-person hot tub. You can take the power consumption of the products listed above and get an approximate running cost using this calculator here. Your inflatable hot tub can include a chemical floater with chlorine tablets. Exactly how many you need to use will be specified in the instructions manual. Generally speaking, depending on how big your hot tub is, you will need to use about 2-6 tablets. However, if you haven’t used the hot tub for quite some time, you need to add a bigger dose of sanitiser, so approximately 40g chlorine granules for 1000 litres. You should also test the water in your hot tub to make sure it’s clean and safe for bath. There are specially designed test strips for the job, which show the pH, alkalinity and sanitiser levels accurately, so you can make the necessary adjustments. It’s recommended to test your hot tub on a regular basis, 2-3 times per week, even when you’re not using the tub. The first thing you need to do is to make sure the water circulates, so it doesn’t have anything that contaminates it. That’s why you should pass it through the cartridge filters. Some models boast automatic circulation schedules which make this step easy. If yours doesn’t, turn it on for 15 minutes twice each day. It’s also important to clean your inflatable tub regularly because they’re prone to scum. Besides, debris can easily get into outdoor spas. That’s why you need to clean it weekly, by scrubbing it with white vinegar and a soft sponge. Don’t forget to clean the outside walls too. You should also clean your filters because their job is to clean the water. You can either rinse them with your garden hose, soak them in a chemical cleaner with each drain/refill cycle, or spray them with a special cleaner on a weekly basis. Which hot tub model above seems like the best for you and why? PracticalHome.uk is a participant in the Amazon EU Associates Program, an affiliate advertising program designed to provide a means for sites to earn advertising fees by advertising and linking to Amazon.co.uk.